Adding a new room onto the side of your existing home is a major undertaking. It’s the equivalent of building a small home from the ground up, but further complicated by the fact that you have to attach it to your existing home. Summarized below is a home addition planning guide that provides advice from designing a home addition floor plan, to hiring the right contractors, to actually building the home addition and realizing your dreams in creating new living space within your home. Building a home addition is an attractive solution for a lot of growing families as it is more cost effective than selling an existing home and buying a larger one. It also prevents the need for uprooting children from their schools, neighborhood and friends. However, it is important to keep in mind that a home addition project is a major construction job that is both stressful and messy. So it is important to go into such a project with your eyes wide open. Thus it is imperative to do a great deal of home addition planning upfront before starting a home addition construction project. First, it is important to realize that building a home addition is also a major remodel to your home. For example, your home addition may involve enlarging your kitchen or attaching a family room or master bedroom onto the home. Thus, why developing a well thought out home addition plan is absolutely critical. Each type of home addition impacts the rest of the home, thus making a home addition project a remodeling task as well. For example, the addition has to tie in functionally and aesthetically to the existing home, both from the inside and outside. In the end, the home addition needs to seamlessly meld into the home, and to to do this well thought out home addition plans is a must. Thinking of a home addition construction project as a remodel will also save money, as it helps to mitigate the size of the home addition, thus reducing building costs, restricting the increase in property taxes and limiting the amount of yard space loss. It is always important to meet with your local building contractor to understand what you can and cannot do, relative to your particular piece of property. There are zoning laws, property setback rules, and easements issues that can impact your ability to build a home addition. 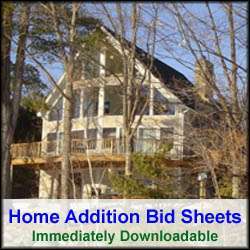 It is better to know these issues upfront before you put too much energy and money into the home addition planning. Building out is typically more cost effective than building up. 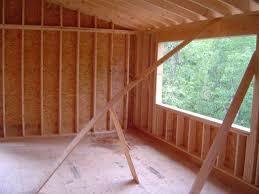 Building a second story home addition also requires a great deal more engineering work. In addition, it is also a more major disruption to the family and will most likely require the family to move out of the home for a period of time during the construction. Building out typically impacts the family less as the actual tie-in to the existing home, e.g. punching in an opening into the main home can be delayed until much of the home addition construction is completed. However, building out takes more yard space and requires excavation and foundation construction. With any major home construction project hiring the right home remodeling contractors is critical. If planning to act as your own general contractor, keep in mind that you will be hiring many contractors, including; an excavator contractor, a foundation contractor, a framing crew, roofers, a plumber, an electrician, cabinet installer, finish carpenter, etc. In addition to hiring all of these contractors you will also need to coordinate when to have them on your jobsite. If this sounds daunting to you, then consider hiring a general contractor who will do all of the subcontractor hiring and subcontractor schedule coordination. Whatever route you go, be it hiring a general contractor or hiring all the sub-contractors yourself, make sure to do solid reference checks and background checks. Hire the wrong contractor and all of your advanced home addition planning can go up in smoke, costing you money, time and major hassles. If you don’t plan to use an architect for your home addition project, then invest in a home design software package. There are many of them available today that are very affordable and easy to use. They are well worth the investment, as they cannot only help you with the design of your home addition, but can also automatically generate building material lists that you can use to more easily obtain material cost quotes. 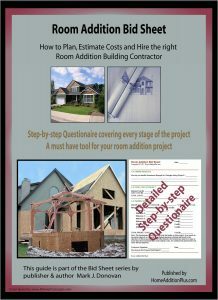 For help on building a room addition, see HomeAdditionPlus.com’s Room Addition Bid Sheet.The Room Addition Bid Sheet provides you with the knowledge and information on developing a home addition plan, and what to look for when hiring contractors. It also includes a detailed cost breakdown table and a spreadsheet for estimating your own new solarium or glass sunroom addition building costs. Fill out our 3-5 minute quick and easy form, and receive a free price quote on a home addition plan from one of our prescreened and licensed home addition contractors. This process is free and there is no obligation to continue once you receive your home addition price estimate.